If loving him is wrong, I don’t wanna be write. 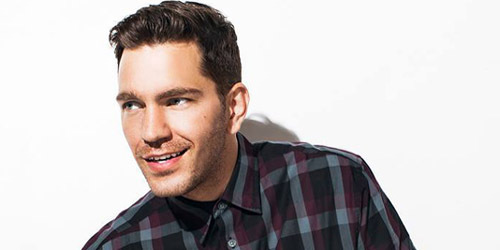 30-year-old singer/songwriter Andy Grammer took his sunny California sound and brightened up the charts starting in the fall of 2010 with hits like “Keep Your Head Up” and “Miss Me”. It was a stellar first era for the performer and his breakout on the scene was well deserved after years of busking on the streets. Now, three years after his self-titled debut comes his second album, a set called Magazines Or Novels. With a diminished amount of airplay and profile, the build has been a struggle, plus it doesn’t help that the album itself has its inconsistencies and forced arrangements. Nevertheless, it is good for a read, even if it’s not a full one. The album begins on a bouncy note with “Honey, I’m Good.” If he needs a period firmly placed in that title, the thirst must be real. Nevertheless, it’s a great retro-influenced track about the power of temptation and a woman with a serious attraction. It does end on a happy note, however, as Grammer shows that he’s faithful in his established relationship: “You got me all wrong baby/My baby’s already got all of my love.” This is followed by first single “Back Home”, a safe and folksy cut about the good old days and recognizing your roots. The former top ten single on my chart is currently stalled out at Hot AC radio. Grammer tries for a more confident pop sound on “Pushing”, track three in the lineup; much like the title, well, it’s pushing it. The edgier tune plays more like a Karmin reject, but it’s passionate enough to deliver on a needed intensity: “We stay in the fire and hope we can burn our way out/The road to my heart gets hot as hell.” A few steps up from there is “Forever”, soaked in a classic R&B style with a cute touch of brass. It’s the closest thing to this era’s “Fine By Me”. He sings to his love, “You take forever/But you’re always worth waiting for… I guess I’ll wait a little more.” It’s neat and to the point. Things go awry at this point, beginning with “Holding Out”, a reggae inspired track with a playful but goofy lyric set. “Remind You”, reminiscent of a late 70’s art rock aesthetic, essentially gets lost in the shuffle for sounding like every indie band trying to break the blogosphere. “Masterpiece”, a slight improvement from there, would sound better for Mat Kearney. However, I do appreciate the lyrics in it, especially the desire to perfect a romance and to not “stop ’til it is beautiful.” It’s very different from “Sinner”, track eight, which dives into pseudo religious theme, not unlike OneRepublic‘s recent material. Luckily, past that middle section, the remaining three cuts on the album are worth the listen. Standout track “Red Eye” brings that self-titled album vibe back around, a solid ode to curious nights and the big dreams that lie ahead. Grammer sings, “While the world sleeps under my feet tonight/I’m chasing myself in the sky… I’ll be up here learning to fly.” “Blame It On The Stars” sees the singer spitting some rap game, though it’s a fervent chorus that is truly the highlight of this. Lastly, “Kiss You Slow” is a gentle sendoff, a piano-led ballad in which the performer states, “I was born with a compass in my hand and a restless soul.” Unfortunately, that compass may be leading him in too many directions at once. Grammer’s versatility on his second full-length album is to be admired, but the payoff isn’t necessarily there. The guy is great when performing on tour and I love him as an act, but when this album inevitably struggles to stick on the charts, it will be for a reason. The effort is decidedly more magazine than novel, a glossy affair that can be skimmed without missing too much. It is a shame that this can’t be as cohesive as his debut, but maybe there’s a lesson to be learned from this going forward. Hey, at least it’s better than your standard summer reading list.